Between the big cities that you’ll always hear about is about 70% of the rest of Vietnam and the 'wild east', as I've named it. Having met and spoken to lots of Vietnamese people, I can confidently say that I’ve seen more of Vietnam than most Vietnamese people; the beauty of traveling by bicycle. It was 26/02/18 and I’d been in Hanoi nearly 2 weeks to let my right Achilles rest and recover and I just hoped that that would be the last of any damn Achilles issues as I excitedly jumped back on Surly Temple to tackle the 2,000km ride south to Ho Chi Minh City and into Cambodia. It had been a while since I'd ridden solo as I'd been riding with Christian and Mike since Luang Prabang, but I was excited to be on my lonesome again, for the challenge and for personal development time. The route out of Hanoi was as hectic as aspected. I used the mapsme app to navigate my way out of a wet Hanoi to Hai Duong, a large city 81km outside Hanoi, with very little going on from what I saw. One thing about the bicycle routes on mapsme is it often add’s 30%+ to your journey and it really takes you around the houses. This particular route took me around some very, very local streets, and through one particular village, a hidden oasis of temples and quiet streets, where locals couldn't believe their eyes and one group of older ladies couldn’t stop laughing when I cycled passed them 4 times after taking a wrong turn and cycling round in a circle for 5 minutes. It was a tough first day back on the bike, with Achilles and knee pain from the off, so I decided to take the following day off an ease back into riding gradually. My dinner in Hai Durong. No one spoke English and none of the menu's were in English, so I just pointed and wasn't disappointed when this interesting concoction arrived in front of me. Again, a perfect example of how well instant noodles can be used. With a day of resting and stretching ticked off, the following day was a straightforward 70km to Hai Phong, Vietnams 3rd Largest city and a major port city sitting just across from Cat Ba island and where the ferry I’d be taking to Cat Ba sets sail. Hai Phong has seen it's fair share of destruction over the years, including a typhoon in 1881, which claimed up to 300,000 lives, followed by years of war and bombing. It had rained most of the day during my ride, which didn’t dampen my spirits, just me, head to toe, but fortunately my Achilles was feeling ok. One particular thing that Maxim, the physio I had in Vientiane, Laos, had said was that a good indication with an Achilles tendon injury like this is how it feels the morning following a days ride or exercise, and so that is how I’ve been monitoring it since. There's one thing that always makes me smile from ear to ear, and that is passing a large group of girls. I pass so many different people daily, but every time you cycle past a group of 10+ girls in Thailand, Laos or Vietnam, you get a gaggle of girls waving, smiling and saying hello, then bursting into group laughter and screaming when you wave back and smile. This, and when you cycle past an elderly gentleman who just looks at you and burst into uncontrollable laughter at the site of you. That always gets me. It was on my way to Hai Phong that I had my first real ‘incident’ on Surly Temple. Riding along in my usual meditative state, and a young guy on motorbike decides to ride straight into the side of my front wheel, hitting my pannier and sending me flying off my bike. Somehow, as he drove into the side of me, I managed to place my bike on the ground, jump off and continue running and stumbling at the speed I was cycling at without hitting the deck. How I don't know, but I probably saved myself some naughty grazes. The young guy was very apologetic and helped me to my feet and I just shook his hand, told him not to worry and cycled off. One thing you always have to expect when cycling in Southeast Asia, and Vietnam in particular, is the unexpected. That, and absolute, nonsensical stupidity and lack of common sense when in control of anything with wheels. That said, it is amazing how the very lack of road rules just seems to work. Pure organized chaos. My arrival snack in Hai Phong. In my defence, it did say "Food" on the sign before I went in. Hai Phong city is a busy, industrial city with the port its main trade. I got changed and headed straight out to grab some food. I sat on the side of a big, busy roundabout in a street restaurant with child-sized furniture, which seems to be a thing in Vietnam. As I’m sat there, taking in the experience and sipping on a beer, a large group of adults and children turn up and sit at a table nearby. It becomes apparent that it is one of the kids birthdays and there were lots of smiles going around. I haven’t stopped smiling for 5 months, so every time they looked over, I was greeted with a big smile and vice versa. Soon enough I had some cake in-front of me from one of the kids who seemed incredibly chuffed with himself and the adults very chuffed of him, and my reaction. Soon after I had a pack of crisps in-front of me as well and it wasn’t long after that, that I was having photo's with the group of kids, at which I was absolutely delighted and had to reciprocate. They seemed to take a real shining to me which was sweet and just a nice experience. Me with a group of friendly kids celebrating a birthday in Hai Phong. The next morning I took a ferry to Cat Ba island, a quick 50 minute, 180,000VND or £5.86, for me and 180,000 VND for Surly Temple boat ride out of the port and into the south China Sea towards Ha Long Bay. Cat Ba is the largest of the 367 islands spanning 260 km² that comprise the Cat Ba Archipelago, which makes up the south eastern edge of Ha Long Bay in Northern Vietnam. Tying my bike and bags to the top of the boat to Cat Ba Island. Cat Ba Island Resort and Spa was the boat I took and it was very straight forward. If you take a bike, they might even split your tire and tube on your bike as well. My first puncture and I wasn’t even riding her. All part of the adventure. After a ‘quick’ repair, the word ‘quick’ being used very loosely here, I took a brief ride around town, stopped for some lunch and booked a hotel. Le Pont Bungalow Hostel, Cat Ba Island. Le Pont Bungalow Hostel on Cat Ba Island has probably one of the best views in Cat Ba and a cool place to stay or even spend a few hours, that’s if you don’t mind rats. If you don’t like rats, then maybe this place isn't for you. I went for a private double and at £16 a night, the scratching comes for free. The following day I had one of the best meals yet in Vietnam at Oasis Bar and restaurant, and a unique take on what I’d already experienced in Hanoi. Bun Cha. I’d originally planned to explore the island by bicycle, but due to my split in both tyre and tube, and the weather not being particularly pleasant, I didn’t do or see as much as I’d originally planned. Kayaking is one of the most popular activities in Halong Bay and Cat Ba Island, and Cat Ba Green Trail Adventures offer a great experience for 20$, with delicious food served on the boat included. A group of 20 different people met at the Green Trail office in Central Cat Ba city at 7am and met Thank, our guide for the day and a cool guy. After a 10-minute bus ride, we arrived to a waiting boat where we were ushered on and taken 45 minutes through the imposing but unfortunately foggy landscape. We passed the famous fishing villages, where over 300 families live on the water of Halong Bay. The children don’t go to conventional school but are supported by the government who subsidies their education and are taught out on the boats on the water. The people source a lot of their fresh water from within the limestone caves, where the water runs through the limestone and is purified. The Kayaking was great and highly recommended if visiting the area. It’s not strenuous or tiring, however, I did do it on a rather chilly, foggy day. In the glaring sun it would be a different experience. I paired up with Leoni who was the perfect Kayak partner. We stopped on Monkey Island where we hiked to the top and were graced with a pretty cool view. Leoni and I navigating around Ha Long Bay. I headed back for dinner at le Pont Bungalows, my accommodation, which is worth going just for lunch and getting away from the not much busier city. After dinner, I started playing some pool and soon enough I am challenged by a local, Vietnamese guy. It seems rules are lacking in Vietnam, with pool being no different, evident when the local guy starts hitting anything on the table and not always cueing the white ball first. I like the competitive nature of any sport, so when this happens, I quickly lose interest. With the local guy maybe sensing my lack of interested, he called it a day. Wanting to play some decent pool, I was pleased to be challenged by Song, a South Korean guy who spoke perfect American! Song was a really interesting and intelligent guy who lived in Seoul and worked in blockchain, which is currently in the spotlight amongst the tech world and investors. It was amazing to meet and talk to a guy on a level I hadn’t spoken to anyone on in a very long time. We talked about the most up-to-date developments in technology, cryptocurrency, ethereum, A.I and the impetus of human psychology and philosophy on all of these, and the people that influence these markets. We ended up playing pool for hours and just chatting and learning. It was interesting to talk about the intricacies of block chain and other technologies that will incontrovertibly mold our future. Great guy. The following day I took a ride around Cat Ba bay to explore a little and ended up going for lunch at Oasis again, where I’d already had the best Bun Cha I’d had in Vietnam, so of course, I had to have it again! It was here I met Borg and Oy, two cool Norwegians. Oy was traveling through Southeast Asia on a motorbike and Borg was staying in Cat Ba for a few months, helping set-up and train the bar operation at the new sister restaurant to Oasis. We had a cool chat and Borg mentioned he was heading to Hanoi for a couple of days to record a Podcast, which he went on to explain. 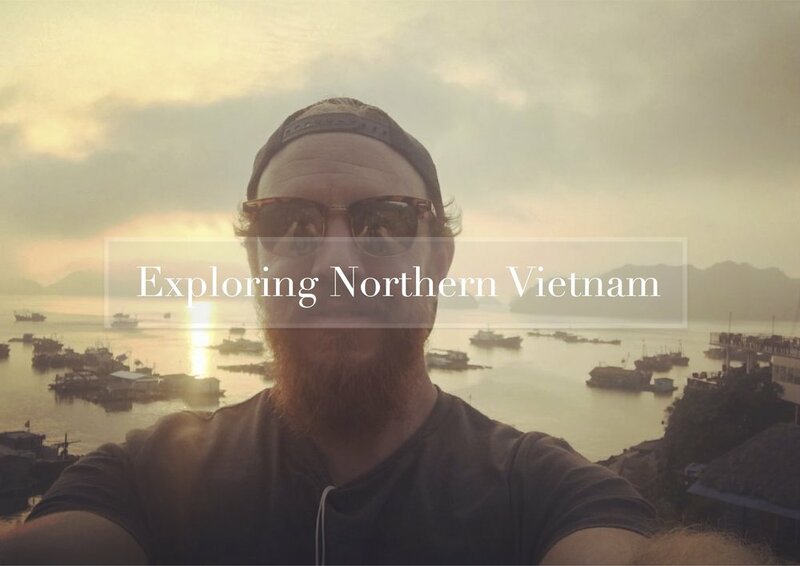 Borg was creating a series of Podcasts being broadcast in Hanoi, Norway and the UK, interviewing people who are traveling, and discussing the psychology behind it. Once back from Hanoi, Borg got in touch, explaining how inspired he was by my story and adventure, and asked if I’d be happy to be interviewed. We met on my last day on Cat Ba Island before I grabbed a ferry back to Hai Phong, and we sat and recorded a 50 minute interview for his Podcast, which was an excellent experience. Borg sent me the questions before hand, so I spent 5 minutes before hand making some quick notes, which I’ve shared with you below. I’ll let you know where and when you can hear the recording of the podcast once I know. A pleasure to meet you both Borg and Oy. My new Norwegian friend Borg, who has created the awesome charity, Green Ribbon. I'll keep you posted once the podcast is out. 5 minute note for Borg's podcast, unedited. It would be same same but different now. On leaving Le Pont Bungalows, I had a great chat with Anais, the manager, who was a lovely French girl who’d worked at the Bungalows for two seasons now. She said that if I was ever traveling in France, to let her know, and she’d put me in touch with her family who would love to have me stay with them. We chatted and I said I was visiting Ninh Binh, so she suggested I stay at their sister resort in Tam Coc, called Tam Coc Bungalows. Anais sent me an email of an information board she’d created, which I though was excellent and one of the most informative, helpful posters I’d seen. The ferry ride back to Hai Phong was a bit bloomin hairy. I was on the phone to my brother and actually had to put the phone down to concentrate on not throwing up and considering my escape route. On arriving in Hai Phong, it was straight to find a new bicycle tire. The guy in the shop was so helpful, he insisted on taking me to his friends' shop to have him fit the tire for me. On my way to find a hotel, I pulled into and rode around the car park of an upmarket shopping complex and down a small street, where I passed two guys and a girl, with one of the guys asking, “how far have you been so far?” in really clear English. I turned around in the road and we started chatting. It was here I met Eddy and Chu from Malaysia and their female assistant. We got chatting and they asked if I’d like to join them for dinner? “Wow, sure, I’d love to” I said, looking down at my bike. “ You can leave your bike at mine” Eddy said, pointing at his front electric gated town house just 15 meters away. The four of us had an outstanding hotpot dinner at a lovely looking restaurant just 30 meters away and chatted away all night. Eddy and Chu run a large packaging company and are big golfers. Eddy is currently teaching Chu, who calls Eddy "Shifu", Chinese for a master or very skilled person. The food was excellent and the best hot pot I’ve ever had. Fresh seafood, wafer thin meats, a great assortment of fresh vegetables and a delicious, crispy wonton that you add to the broths, which softens and absorbs the flavor. An incredible experience with amazing people. and great food. Dinner with Eddy (L) and Chu (R). Great guys and a real pleasure. During dinner Eddy suggested I stay at his place as he had a spare apartment on the top floor, which was so kind of him and of course I said yes. The room was great, so after a delicious dinner, which Eddy kindly also covered, and a quick night cap beer, I hit the hay. Eddy said to "leave the key in the room and just let yourself out when you are ready". They were super great guy’s, and we are still in touch now which is great. Eddy, Chu, I look forward to our paths crossing again one day and maybe even on a golf course. I'll be in Malaysia in 4 months if you are visiting, but definitely let me know if you are in the UK at all. The following day from Hai Phong was a 92km ride to Nam Dinh, then a wet and wonderful 45km to the incredibly scenic Tam Coc, Ninh Binh. Tam Coc is part of the Tràng An Scenic Landscape Complex UNESCO World Heritage site and is known as Ha Long Bay on land. Meandering rivers through karst limestone formations surrounded by rice paddy fields make for stunning boat rides and off-road cycling. Tam Coc Bunglalows is where I stayed and a great choice when visiting Tam Coc. Nicely set back from the main high street amongst the local back streets of Tam Coc and overlooking the river where you can see hundreds of people a day, passing by on longboats, being propelled by Vietnamese people using their feet. It was here I met Mac, a Japanese cyclist who had ridden from Japan through China. Mac was a great guy and interesting to talk to about Japanese heritage, culture, religion and cycling. Mac was actually a professional off road motorcyclist and a cycling enthusiast, and after issues with his job, decided to embark on some bike touring. Mac was riding a ‘Fat Bike’, and for those of you who aren’t in the know, a “Fat Bike is an off-road bike with oversized tires. In Macs case, these were over oversized. We decided to take a ride out to Hoa Lư, the capital of Vietnam in the 10th and 11th centuries. Now, I usually get a lot of people staring at my bike as I ride through anywhere in Southeast Asia, but Mac’s fat bike take’s it to a whole new level. Meeting some amigo's along the road, only the 2nd, after Mac. We took a ride out through the back lanes and fields of Tam Coc and finally reached Hoa Lư where we rode around and took in this ancient, former capital city. At one point we were surrounded by 20+ people, squeezing our tires and general looking at our bikes with a mixture of intrigue and amazement. After the ancient capital, we crossed the road and visited Am Tien Cave or Tuyet Tinh Coc as it’s known; an incredible gated green lake, completely enclosed by mountains and rock formations with a temple set at one end, a very large gate at the other, a path around the lake, and all entered via a very large concrete tunnel. Goat is very popular in this region of Vietnam and as we cycled along the road, we passed a dozen wooden stalls selling whole dead goats that look like they’d been taken to with a blow torch. Goats being sold along the side of the road. I had originally planned to ride with Mac for a few days, but when the day came to leave, I came down with another dodgy belly, so decided to delay leaving till the next day. Tam Coc had great and now it was time to start the journey further south, into parts of Vietnam less visited.